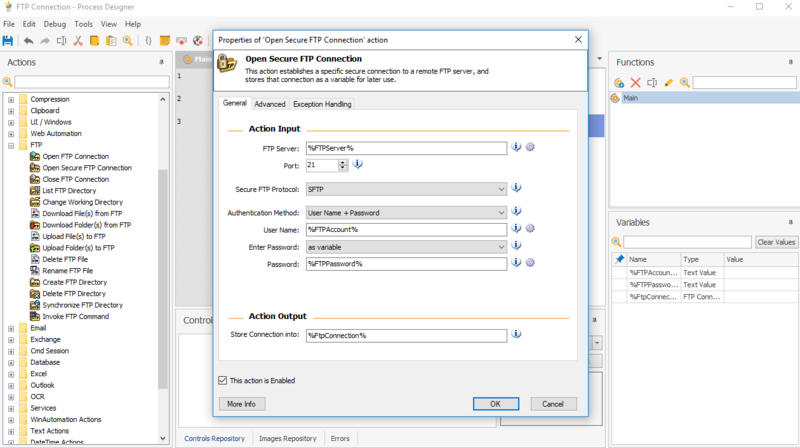 In a long series of features, WinAutomation comes complete with FTP Automation Actions that will make you re-discover FTP. FTP uploading or downloading is typical when it comes to processes that have to do with data updating, orders submissions, invoicing and accounting procedures, clients’ forms, general document storage, or other uses that need bulk manipulation of ftp files and folders. Automate your FTP related tasks with the wide variety of FTP actions that WinAutomation provides. Upload or download files from FTP, sync with remote directory, do everything with a twist of modern day automation. Stay in touch with the files exported from your marketing department when they output their latest graphic source files at the end of each week. Automate the synchronization of your local copies to other online directories placed on FTP servers, have the latest updates from any software download automatically when their FTP folder is updated and do pretty much anything with big files placed online. 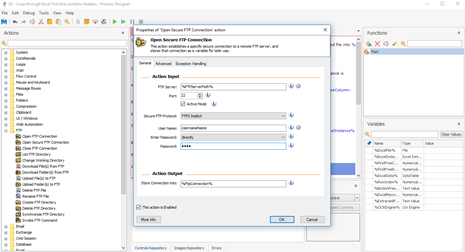 With WinAutomation FTP actions you will see that FTP was never this clever OR effortless!